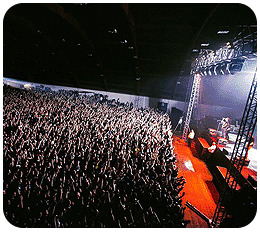 After 5 long years (sorry – “4.5 years” as Chuck would correct me), Simple Plan returned to Prague, Czech Republic and once again performed at the very-close-to sold-out Malá Sportovní Hala venue at the exhibition grounds – making it the biggest show of Simple Plan’s whole European tour (more than 4000 people). 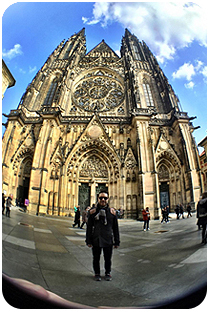 The guys from Simple Plan however arrived to Prague a day early (after their show in Zurich) and for the very first time had the chance to walk around the streets of the Old Town or visit the St. Vitus Cathedral in the capital city of the Czech Republic. 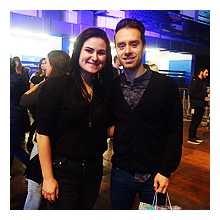 If you followed SimplePlan.cz on social media during the day of the show, you already know that the crew started loading out Simple Plan’s gear from the stage truck around noon and that was also the time when the first fans started to show up at the venue and despite the rather chilly weather managed to hold on and stick around until the doors opened. Finally, at 7pm the doors opened and the fans rushed to get the best places in the house, which was divided into the front of stage sector (tickets to this sector were sold-out within just 3 days!) and the regular standing sector. Shortly after 8pm, the London based band called The Bottom Line took the stage and kicked off the show with their very interactive set. After them, it was Ghost Town’s turn to perform and show what this L.A. band can do. The moment the Czech fans have been waiting for since 2011 finally arrived at around 9:30pm when Simple Plan hit the stage and completely blew the minds of all the attendees of the show. As you can see from the setlist, when it comes to the songs the band often changes up, Simple Plan chose to perform Your Love Is A Lie, I Refuse, Farewell and This Song Saved My Life for the Czech crowd. 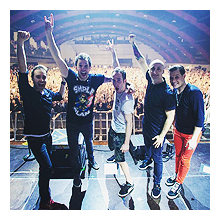 But it wasn’t just the band that had some surprises up their sleeves: for the 3rd time now, SimplePlan.cz organized another sign surprise for the band [you may recall the Thank You signs in 2008 and 2011], but this time on a completely different level, called “Czech Out The Rest Of Us”. For many months now, the fans have been working on their original signs with words from the lyrics of the song The Rest Of Us, which described them the most (either still or in the past) – such as ‚geek‘, ‚loser‘, ‚confused‘ etc. The plan was to hold the signs up with the first beats of the song The Rest Of Us – and this plan worked out perfectly. A sea of signs could have been seen from the balconies of the venue as hundreds of fans raised their confessional signs above their heads. The band was stunned. Later on, the band members commented on the surprise, saying it brought tears into their eyes and that they were fantastically surprised and very very moved. Our project was a huge success and I’d like to thank each and every one of you who attended the show and took part in this. You were incredible. Overall, the show has been an extreme success. The fans, the opening bands, the promoters, the label and the band all thought this was an incredible show. Mostly the band later stated on Twitter this was the best show Simple Plan have played in a very long time. So big thanks to everyone who attended the show – you were an amazing crowd and thanks to this, the band is already planning to come back soon again. A big thank you goes to the whole Charm Music team for setting this whole show up and being extremely helpful in the past few months. Same thing goes to Libor Lisy from Warner Music, for all his work on this show – thank you! I also can’t forget the lovely crew – Sim, Chady, Sean, Mike, Danny, Adam and Frank – you guys were fantastic, great job as always. And finally, Pierre, David, Chuck, Jeff and Sebastien – thank you for coming back, playing the best show possible and still taking the time to hang out with fans after the show. It was an honor to have you back. See you soon.